At last, you have a chance to get a new client. But, unknown to you, there’s a saboteur hiding in plain sight — armed and ready to kill any chance of working with your new (but soon to be gone) visitor. It’s all good for now, she landed on the homepage and took a trip into your wedding photography gallery. Faster than a backslap from Batman himself, she’s gone. Along with your chance to get a new wedding client. Is Your “About” Page Sending People Away? My jaw hit the floor when I noticed it for the first time. There was a terrible mistake—hiding in plain sight on my website—and it had been there for ages. Definitely not the high point of my day. I’d just spent an hour listening to an expert copywriter talk about the most basic of our web pages, so I quickly checked my own website to discover I’d made a critical mistake before I ever found my first client. When I originally sat down to write my “about me” page with the all-important “photographer bio”, I kind of assumed the “me” in “about me” was a bit of a clue. It’s right there in black and white (or whatever font color you want to imagine): “About Me”. Sorry, dude, but this is a one-man business I’m running here. I open and close the studio, write the marketing, talk to prospects, do the photography, make sales, and create the finished product. I even sweep the floors and clean the toilets. Who the heck else is my “about” page supposed to be about, if not me? Hello? It’s supposed to be a photographer bio, isn’t it? And that’s when the full impact of my mistake hit me like a ripe watermelon in the face. By focusing on just me, I’d turned myself into that annoying person you meet at parties who traps you in a corner and spends the rest of night talking about himself with barely a pause for breath. It was time to get to work and fix this disaster before I lost yet another potential client. What's The Secret Sauce Of A Good About Page? …but from your client’s perspective, not yours. No one will resonate with such a me-centered message. Do you feel awkward posing in a stuffy studio with more equipment than an operating room? Most of my clients feel the same way, so I do away with all that and take you to a gorgeous outdoor location where you can relax and just be yourself while I create the most amazing portraits you can imagine—all while having fun! Which version do you think your potential clients will prefer? My money’s on the second one. Failure to follow this basic principle (like I did, ugh) creates a big leak in your marketing system, resulting in lost leads, fewer clients, and a general lack of revenue! Like so many others, I mistakenly assumed that writing a photographer bio page was easy. After all, how complicated could an “about” page be? So I made the same darned mistakes that thousands of others had before me. There’s no doubt, this is a well-trodden path. And, like most other photographers, I immediately listed all the relevant things about myself to include on the page. With the benefit of 20/20 hindsight, here’s what NOT to put on your “about” page, at least not in a raw “me-centered” form. How Does YOUR “About” Page Measure Up? If you haven’t already, open a browser and go to your “about” page right now. Despite being only a small part of your marketing machine, you risk crippling your entire system if you mess this page up. Your photographer “about” page is (or should be) one of the most visited pages on your website. If it fails to do its job efficiently, it’s the same as having your salespeople asleep at their desks. When prospects visit your “about” page and see it’s all about you and not them, there’s no connection and they leave without taking action. Sadly, this means the effort you invested into attracting those visitors with your marketing is all wasted. Plus, if you only see a handful of visitors each day, every person who leaves without contacting you feels like a much bigger loss. When you need more clients like you need water in the desert, any leak in your marketing is a HUGE problem. How does your page read in light of what we’ve talked about so far? Is the wording centered around you, or your client? You can also look for tell-tale signs such as overuse of the words “I”, “me”, “we” or “us”—and replace them with “you”. Want more portrait and wedding photography online but don't know where to start? 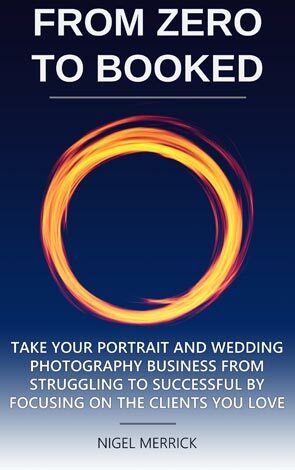 Fact: Most wedding and portrait photographers struggle to get their name out there to find more of the right clients. But, in "From Zero To Booked" I show you everything you need to identify your ideal clients, create compelling marketing that makes an impact on them, and how to turn them into paying customers. Discover how to take your photography business from struggling to successful by focusing on the clients you love. Before I finish, there’s one more important topic to consider because there’s a LOT more to this than simply showing people what you’re all about. 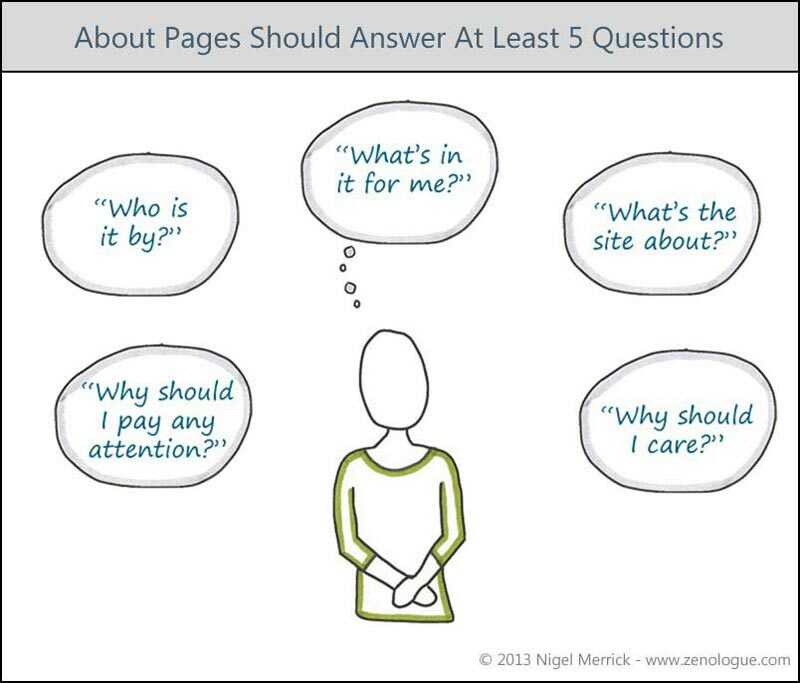 The most effective “about pages” are great at answering 5 basic questions in your prospect’s mind. Why should they pay any attention? Have you established your credibility? If not, there’s a great way to do so. Who is it by? You’d be amazed how many websites I see where it’s not clear who the photographer is, or where they’re located. What’s in it for them? How will the prospect benefit from working with you instead of your local competition? What’s the site about? This isn’t such a great problem with photography websites, but it’s worth restating the types of photography you offer, your services and products. Why should they care? This is all about making an emotional connection with the prospect, and showing them how much you care about their needs and desires. If you can answer those in ways that evoke emotions, you’re well on the way to a great photographer bio page that makes a meaningful connection with your prospects.